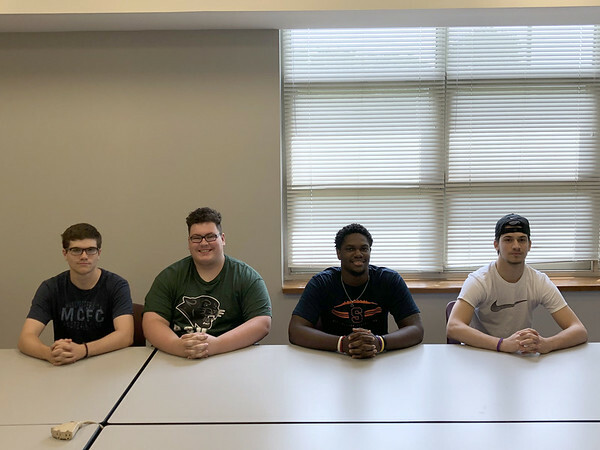 BRISTOL - As the Bristol Eastern football team gears up for another training camp, which is now just weeks away, four players from last year’s squad have finalized their college decisions and will be continuing their playing careers. Left tackle Andrew Consalvo and kicker John McPhee, a pair of best friends since they were young will be taking on the Plymouth State campus together this fall and competing for the Panthers football team. Rajon Collins and Ariza Kolloverja will also be continuing their football careers at Division III schools. Collins is heading to Becker College and Kolloverja to Western Connecticut State University. Consalvo was choosing between Plymouth State and Salve Regina, but the decision ultimately came down to where he felt was best for him. The left tackle over the last two seasons improved from his junior to senior season and was a big part of the offensive improvement led by Lancers quarterback Justin Marshall. While Consalvo’s departure leaves a void on the left side, it’s a good pickup for a Plymouth State team that finished last season 9-2. McPhee will be looking to become the kicker for the Panthers after senior kicker Jeff Madden graduates. While Madden is set to depart following this coming season, McPhee will have to beat out Jeremy Martin for the role, who will be a junior. Over his time at Eastern, McPhee stabilized the kicking game and will leave another hole the Lancers will need to fill. And since taking up the sport, McPhee has loved a certain part of being the kicker. Both Collins and Kolloverja will be making position changes at the college level. Collins will be moving from his defensive end spot to play outside linebacker and safety at Becker College. At Eastern, Collins was a presence in the backfield, especially getting after the quarterback as the primary pass rusher. He believes his game is best suited in open space at the next level and that is the reason behind the move. Collins has spent the summer training with Kolloverja, who played safety at defense for the Lancers, in order to be ready to go in the fall at the new position. Playing for the Hawks wasn’t Collins’ first decision. He was seeking out a junior college team to play for but couldn’t find one before opting to go to Becker. Still, Collins has left that option open and hopes he can shine on the field for the Hawks, leading to a move to a higher level of football. Kolloverja will be transitioning to wide receiver for the Colonials this fall after playing running back for Bristol Eastern, where he showed off an ability to catch the ball out of the backfield and make tacklers miss in open space. Western Connecticut State went 7-3 last season and Kolloverja hopes that continues with him on campus. The four players from Eastern moving on to play at the college level want to make a mark, something that wasn’t done in the win/loss column at Eastern but may have been done off the field. Posted in The Bristol Press, Bristol Eastern on Monday, 6 August 2018 21:07. Updated: Monday, 6 August 2018 21:10.